Alfa Romeo 166 PDF Workshop and Repair manuals, Wiring Diagrams, Parts Catalogue, Fault codes free download! Alfa Romeo 166 (Series 936) is a business-class sedan produced by the Italian company Alfa Romeo in 1998-2007. The design was developed by the Alfa Romeo Style Center under the supervision of the chief designer Walter De Silva. The model passed one restyling in 2003. The car was ready for production in 1996, however, the company’s management decided to first introduce the younger model, 156. 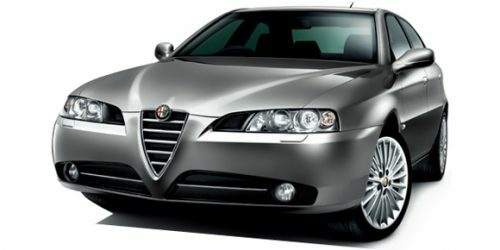 166 replaced the Alfa Romeo 164 in the market, and although the 164th style was far from the traditional, the style of the 166th Her drooping headlights and sharp nose looked pretty defiant. The model was immediately available with gasoline engines Twin Spark: 2.0 liters. (155 hp), 2.5 hp. (190 hp); 3.0 liters. V6 (226 hp) or 2.0 liters. V6 Turbo (205 hp). The line of diesel engines consisted of five-cylinder turbodiesel engines of 2.4 liters. 10-valve with a battery system of 136 hp. (100 kW). On the model with the Twin Spark (TS) engine, 5-speed mechanical gearboxes, 2.5 liters, were installed. and 3.0 liters. models had the option of automatic gearbox Sportronic. Until the year 99, 2.5 were equipped with a 5-speed manual gearbox, later also as a 3.0 and V6 turbo, only a 6-speed. In the database, the buyer received: 16 inch wheels, electric windows of all the windows with their closers, electrically heated mirrors, central locking, halogen optics, ABS, four airbags (two front and two side integrated in the front seats of MOMO), factory glass tinting , velor armchairs with electric backs and elevators. Inside, the climate control of Siemens is controlled by ICS (Integrated Control System) with a color display, in which the on-board computer and the Becker head unit with a cassette deck were also built in. Audio preparation consisted of 8 speakers (four midrange and four high frequency). Optionally, it was retrofitted: GSM phone, CD changer, navigation system and separate Hayes sound amplifier, along with, in the rear shelf, two low-frequency speakers appeared. V6 with mechanics had a cruise control and a traction control system. Also, with an additional order, you could get: xenon optics with headlight washer, rain sensor, 16 or 17 inch alloy wheels, leather trimmed steering wheel and gearshift, salon mirror with auto-darkening, control of incoming calls and radio tape recorder on the steering wheel, electrically folding side mirrors , a sunroof, a rear window curtain and an anti-theft system. Velor, it was possible to change to a tapestry or a skin of different colors, namely black (with perforation / without) cream, marble (gray) and blue. Front seats, the same as the memory, electric drives and heating. The Super package was only available for 3.0 Mpp and 2.0 V6. The base was equipped with 16 inch alloy wheels with a circular notch made of diamond crumbs. With a separate order, she was available: a red leather interior, perforated leather on the steering wheel and wings. All machines of this configuration were equipped with the function STR (Sport Throttle Response). The suspension of the car consisted of two transverse levers from the front and a multi-link suspension on the rear. Unpleasant moments can be considered a very large diameter of the turn (12 m.) And short-course suspension. In 2001, due to the introduction of new environmental requirements, the car has updated the range of motors. 2.0 V6, it was decided not to translate into new standards and it was withdrawn from production. 2.0 Twin Spark as well as the rest purchased two additional catalysts and became compliant with the Euro-3, its power at the same time fell to 150 l / s. Then he began to be aggregated with a six-speed transmission. 2.5 liters. The engine was redesigned and produced 188 hp. (138 kW) 3.0 weakened by 6 mares and represented 220 l / s. 2.4 diesel was broken up to 140 l / c.
The 166th got restyling in 2003. The interior trim and engine line was updated. The style of the car has changed solidly. The new in front of the car was redesigned as well as at the 156th and lost its lowered main headlights, and also presented 3.2 liters. V6 engine capacity of 240 hp well-known for the 156 version of the GTA version and the GT model with the same volume. 2.0 liters. Twin Spark has replaced the control unit and in connection with this has acquired the ability to install cruise control. While 3.0 liters. the version became available only with the automatic gearbox Sportronic. Diesel engine 2.4 liters. R5 was redesigned for Multi-Jet technology, which allowed to install 5 degrees of injection per cycle. The rechargeable fuel system was updated and gave out already a pressure of 1400 bar and had 4 valves per cylinder, which gave the leading position in its class capacity of 175 hp. (129 kW). The car began to be equipped with eight airbags. Optional 18 inch alloy wheels “spokes” and a number of other designs. TI Kit Only for 3.2, 2.4 (175 diesel) and 2.0 TS. They were different: sport suspension package, “own” 18 inch wheels, red instrument scales, metal pedals, TI symbols on the front fenders and the stern.